In 2014 HT Pros will compete head to head for 1st place checks guaranteed to pay up to $40,000.00 and a first place championship prize of $50,000.00 in the HT Redfish Elite Series. With the HT Professional Redfish Series those pay days are not big news in and of themselves, but what is...... For the first time in professional redfishing the pros chasing the spotted tails and big paydays will do so alone. 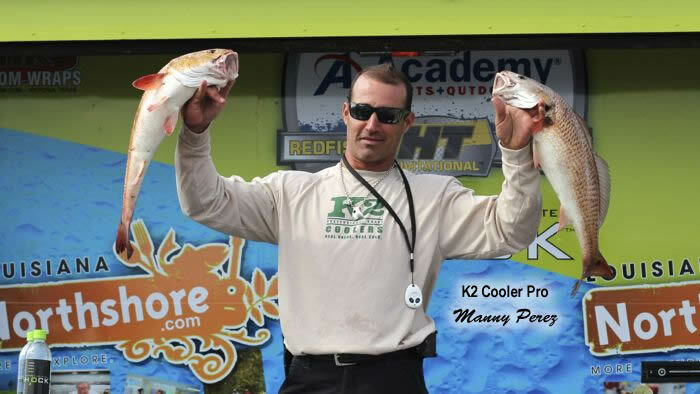 The HT Redfish Elite Series will feature professional anglers competing mano y mano, head to head, 1 angler per boat. No draw partners and no teams. Tour Marshals with Go Pros on a stick will accompany the anglers as they head out to battle the elements and fish, for the first time in professional red fishing, solo.Tour officials and volunteers will help get anglers rigs backed down and launched but after that, these pros will be on their own to locate, catch, land and weigh in their fish. No team mate to blame or to share the credit and large checks with.The anglers competing on the Academy Sports and Outdoors HT Invitational Team Series over the past 3 years have asked for this and we are going to provide it. It will be exciting to see how some very successful teams can do individually when they are split up, this is sure to offer some exciting footage as well. Another unique aspect of the HT Redfish Elite One Man Series is, OFF LIMITS and not just to information, as is the norm for all HT Invitational Team Series events, but now, 14 days prior to the week of each Redfish Elite Series event will be a "dead" period. Anglers competing in the event cannot be on the water within 100 miles of the official launch point for the event or must follow all off limits boundaries as set forth by tour and delivered to each angler 30 days prior to first day of off limits.Should anglers be over 100 miles from official launch point, they can in no way access those waters during the tournament. In other non team sports this is a natural happening, NASCAR, Golf, Bass Fishing and more seek out their best competitor and in 2014 the HT Redfish Elite Series will do the same. Many of the 40 available spots have already been snatched up by anglers wanting to locate, catch and weigh their own fish, for 3 days of competition. See the list here.HT will host an open qualifier to fill the remaining spots November 1-2 in Slidell, La.. Get signed up today... Stay tuned as more information is made available but suffice it to say, if you are an "A" personality and enjoy doing your own thing, The HT Redfish Elite Series will be for you. Be sure to reserve your spot in this singular chance to qualify to join the pros in 2014 that want to fish head to head in this exciting one angler per boat format. Check out this and other exciting professional redfishing news at HT's Fan Page.